Bellator played two fight cards back to back this past weekend, streaming it on DAZN and Paramount TV. Unfortunately, these services leave out the Republic of Ireland and the United Kingdom in their broadcast. The last Bellator card broadcast live in the UK and Ireland ran into difficulty as the main event between Gegard Mousasi and Rory MacDonald cut out to play an episode of Peppa Pig. 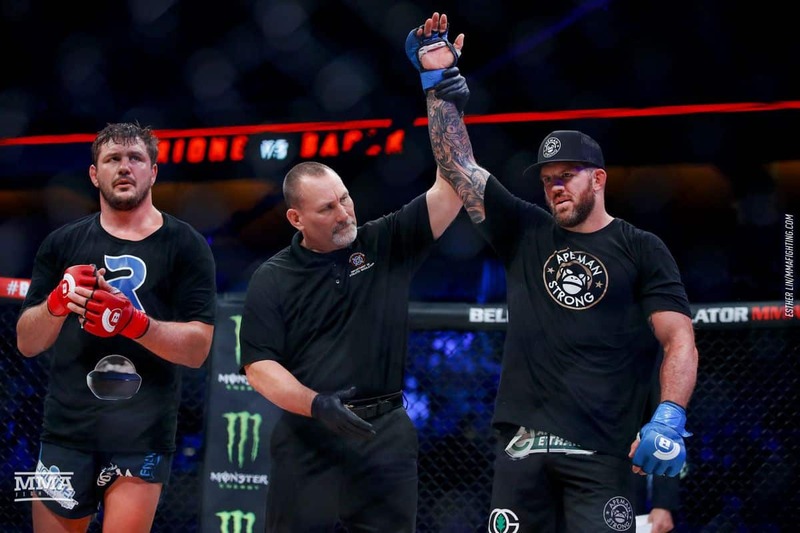 Friday night Ryan Bader defeated Matt Mitrione for his slot in the Bellator Heavyweight tournament. 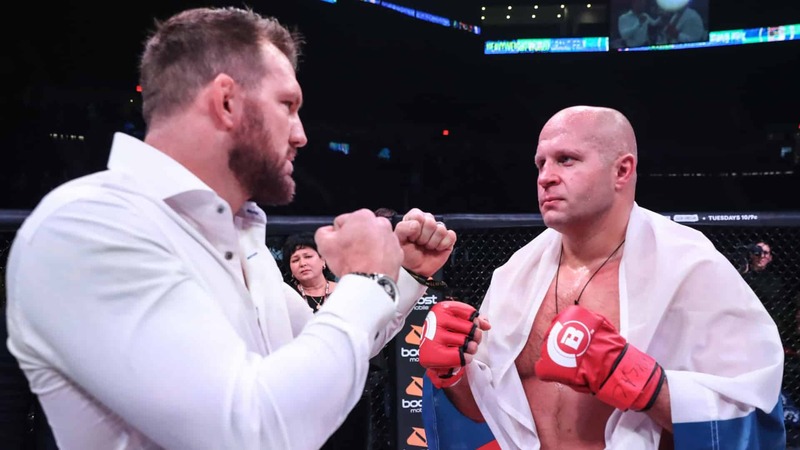 On Saturday Fedor stopped Chael Sonnen in the Semi-Finals of the Bellator Heavyweight Grand Prix this Saturday. Mike Kimbel made his night easier on the under card by knocking his opponent out in six seconds. Corey Browning weathered an aggressive Kevin Ferguson Jr. and won by TKO for his troubles. He reversed a submission attempt in the gassed Ferguson Jr. and advances up the ladder. Lorenz Larkin defeated Ion Pascu and became the alternate for the Bellator Welterweight Grand Prix. Kharitonov did a great job jabbing Nelson up with left and setting up his booming right hand for the win. He swarmed on Nelson for the finish with a second left to go in Round 1. An undersized Ryan Bader took the fight to Matt Mitrione in the main event and has secured himself a slot in the finals. He pressured Mitrione with his wrestling acumen and controlled the fight from top position, dropping bombs from along the fence for a large part of 25 minutes. Ryan Bader def. Matt Mitrione via unanimous decision (30-25, 30-24, 30-25). Sergei Kharitonov def. Roy Nelson via KO at 4:59 of Round 1. Lorenz Larkin def. Ion Pascu via unanimous decision (29-28). Corey Browning def. Kevin Ferguson Jr. via TKO at 2:08 of Round 2. Mandel Nallo def. Carrington Banks via KO at 0:57 of Round 2. Andre Filaho def. Javier Torres via majority decision (29-28 x2, 28-28). Sarah Click def. Krisit Lopez via unanimous decision (30-27). Mike Kimbel def. Alex Potts via KO at 0:06 of Round 1. Pat Casey def. Kastriot Xhema via unanimous decision (30-26). Henry Corales scored an impressive knockout with a lead left hook that sent his opponent crashing to the canvas. Both men exchanged wildly which allowed Corales to land that fight-ending punch. Cheick Kongo finished his contest in 68 seconds. With this knockout, he could be an alternate for the finals of the Heavyweight Grand Prix if Bellator needs a replacement. Benson Henderson had his hand raised after a dominant showing against Saad Awad. Benson used those powerful round kicks of his and secured takedowns to get on his way to a Lightweight title fight. Fedor Emelianenko administered flurries on the feet that sent Sonnen reeling around the canvas. Once Sonne attempted a scramble as he slipped from the back mount Fedor used his trademark ground-and-pound to finish Sonnen. 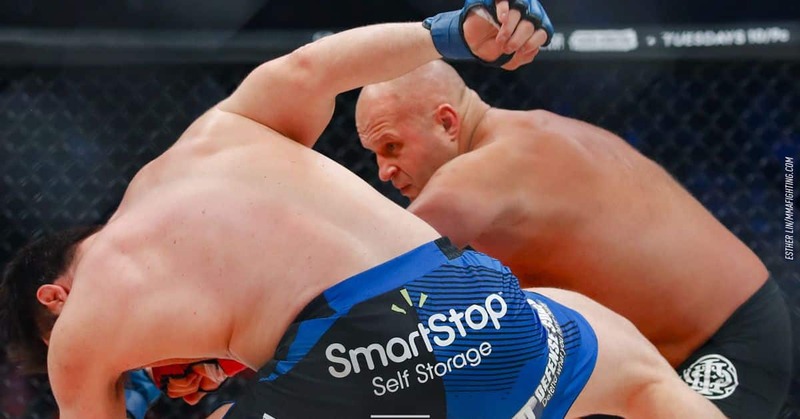 Fedor won by TKO at 4:36 of the first round due to ground and pound. The finals for the Bellator Heavyweight crown will be contested on Jan 26. 2019. Fedor Emelianenko def. Chael Sonnen via TKO at 4:46 of Round 1. Benson Henderson def. Saad Awad via unanimous decision (30-27, 30-26, 30-26). Cheick Kongo def. Timothy Johnson via KO at 1:08 of Round 1. Anatoly Tokov def. Alexander Shlemenko via unanimous decision (30-27, 30-27, 30-27). Henry Corrales def. Andy Main via KO at 2:08 of Round 3. Jennifer Chieng def. Jessica Ruiz via TKO at 1:22 of Round 1. David Meshkhoradze def. Shaquan Moore via split decision (30-27, 28-29, 30-27). Tommy Espinosa def. Sukhrob Aydarbekov via submission (armbar) at 1:27 of Round 1. Nick Fiore def. Jerome Mickle via unanimous decision (30-27, 30-27, 30-27). Jeremy Puglia def. Eric Olsen via TKO at 3:16 of Round 1. Dennis Buzukja def. Ryan Castro via KO at 2:53 of Round 1. Andrews Rodriguez def. Mike Diorio via unanimous decision (30-27, 30-27, 30-27). Zarrukh Adashev def. Christian Medina via TKO at 1:08 of Round 1.